Light up your driveway, front yard or back yard with a bright 1200 lumen PAR38 (100W replacement) as you arrive home. Extend your Hue system outdoor. Use one system indoor and outdoor to light your home smarter. Suitable for use in wet locations. Screw into an existing PAR38 fixture provided it does not have an motion sensor or timer or buy the PAR38 luminaire from Philips Hue! Product requires Philips Hue bridge for smart control. Not included. From sunrise to sunset, the Philips Hue White Ambiance A19 Dimmable LED Smart Bulb changes how you light your moments at home. With wireless control on your smartphone or tablet, choose the perfect light setting for any mood or activity such as reading or relaxing, concentrating, or energizing. Requiring the Hue Bridge (sold separately) for the full Hue experience, this bulb fits standard-size table lamps. Install the LED light as you would install ordinary bulbs, pairing them with the Hue Bridge, which allows you to control smart-bulb-equipped lamps and overhead lights via the Philips Hue App. Easily expand your smart lighting system with Hue accessories (sold separately), such as a Hue Dimmer Switch, Hue Tap, or Hue Motion Sensor. Pair it for automation with your existing Nest or Samsung SmartThings system. This box includes one Philips Hue white A19 standard light bulb, manual, and two-year warranty. 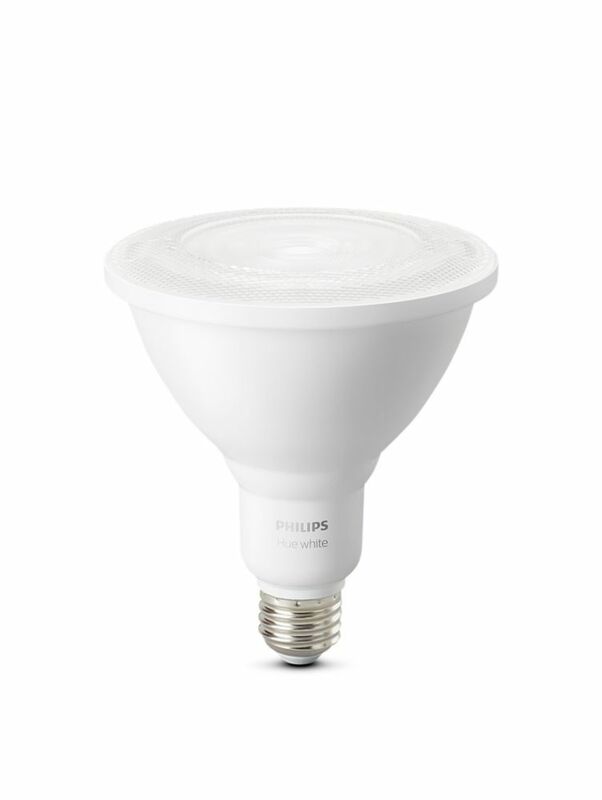 Philips LED 60W A19 household bulb. Energy savings and long life. Bright white light. Dimmable. Instant-on light. Replaces a 60W incandescent bulb. Similar size and shape as regular 60W incandescent A19 bulb. Replaces a 60W incandescent bulb. Ideal for table and floor lamps. Medium base (E26). ENERGY STAR certified. Hue White PAR38 Outdoor Single - ENERGY STAR® Light up your driveway, front yard or back yard with a bright 1200 lumen PAR38 (100W replacement) as you arrive home.